Of the better known apparitions of the Virgin Mary, the Knock apparition in 1879 in County Mayo reveals the Mother of Jesus a little differently. 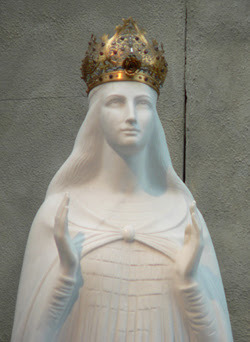 Mary typically appears to humble people, living the simple life with few riches, and the appearance at Knock follows this pattern though there were 15 people who saw her. And at Knock, Mary appeared with others – St. Joseph and St. John the Evangelist. Mexico City (Guadalupe) in 1531, Paris (Miraculous Medal) in 1830, Lourdes in 1858, Fatima in 1917 and Medjugorje in 1981 were places where Mary appeared solo and gave a message to those who saw her. Sometimes the message was lengthy and continued on for years as in Medjugorje. All the messages encourage us to pray and take steps to move closer to Christ. In Knock, Mary said nothing. Her silence perplexed those trying to gain meaning from the apparition because without words, there seems to be no message. No message can be interpreted as no purpose or reason for the apparition. On a rainy Thursday evening, August 21, 1879 the apparition occurred in the small town of Knock, located in the Northwestern part of Ireland in County Mayo. The vision was first seen by Mary McLoughlin who was serving as a housekeeper to the parish priest. Mary saw a light at the end of the church wall which appeared to be three standing figures. When she looked closer, she saw the Virgin Mary with her eyes lifted heavenward, St. Joseph and St. John the Evangelist who was holding a book in one hand. There was also a lamb on an altar with angels hovering over it. Mary left the scene frightened but word spread throughout the village about the light and figures behind the church. Eventually fifteen people – men, women and children – gathered at the church wall and saw the same vision. Statements came later from other villagers that they could see a “light” hovering over the church from a distance, through the rain. Once word of the Knock apparition spread, people from all over Ireland began came to the site to pray and ask for healing. Eventually those numbers climbed into the thousands and in 1976 a new church had to be built. Today visitors and pilgrims to Knock exceed one million each year. 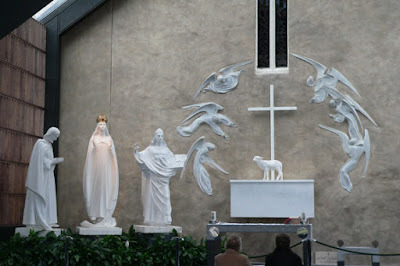 Life-size statues of the Virgin, St. Joseph, St. John and the lamb with angels were commissioned and placed near the old church wall to recreate the apparition based on descriptions given by the visionaries. Today the area of the apparition with the statues is enclosed to offer pilgrims a quiet place to sit before the apparition site in a protected environment. A glass ceiling and walls around the statues connect the new chapel to the old church allowing natural light to pour in. From the outside the old church is still easily seen. There have been several additions and the extension to the rear where the apparition was seen is identified by glass, so pilgrims can view the apparition from the inside or outside. I visited Knock on my first trip to Ireland in the early nineteen nineties. I knew the story from song “Lady of Knock” recorded by Dana. We visited on the feast of the Assumption – August 15th – and we attended Mass there. My second visit was this past February (2007), and though I was there, mid-week in the lowest season for tourists in Ireland, the place was had a good number of pilgrims. It’s obvious that the site gets thousands of tourists weekly, just looking at the amenities available. There is a large, high cross now erected in the Knock church complex. It marks a visit to Knock by Pope John Paul II in September of 1979 – 100 years after the apparition. This is the cross of the altar on which our Holy Father, Pope John Paul II celebrated Mass on the occasion of his visit to the Knock Shrine. The cross itself, modeled on the ancient Celtic Cross of Ahenny, remains in grateful remembrance of the greatest event in Irish history since the coming of St. Patrick. I almost didn’t make it to Knock this last visit. I had only a few hours of daylight to get back to Shannon from Castlebar on my last day in Ireland. It was a rainy, gloomy day…. good weather for reflection. I didn’t get a real sense of thinness when I first approached. The site is like Disney World. There’s now a huge church that hold 2000 people, a complex for walking and meditation, spigots that will provide holy water from Knock for taking home, and even a rest area with bathrooms and areas for washing up. Once I got in the chapel in front of the statues and sat awhile, the thinness washed over me. I have wondered for years why she was silent when she appeared in Knock. What is the meaning of her silence? Perhaps the Virgin Mary was silent because she listening. The statue reminds us that she’s still there … and may be listening. You say about the apparition "Her silence perplexed those trying to gain meaning from the apparition because without words, there seems to be no message. No message can be interpreted as no purpose or reason for the apparition"
I do not blame you for saying what you say above because the apparition is represented officially as merely another Marian apparition. 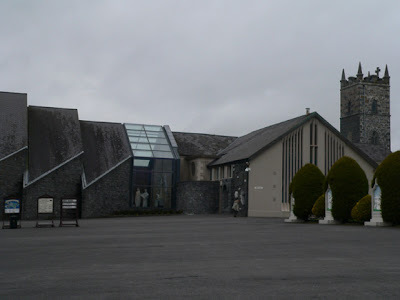 But I have been visiting Knock for over 20 years and I come from the same background as those who witnessed the apparition and it took little observation to see that the apparition represents the four positive and essential elements of Christianity (1) Humility (2)Prayer (3)The Law of God (4) the offering of sacrifice.